Increased public awareness of the risks associated with concussions has led to a surge in patients visiting emergency departments — and statistics Canada reports some 30,000 concussions or related head injuries are recorded annually in Canada for patients 12 to 19 years old. While most minor head injuries don’t require hospitalization, some can involve further monitoring and even surgery. A computerized tomography (CT) head scan is a primary diagnostic tool used by emergency room doctors to determine the scope and immediacy of medical treatment. However, it’s not without hazards as exposure to ionizing radiation can lead to a patient’s increased risk of cancer, says Dr. Mike Ertel, clinical instructor with the department of Emergency Medicine at Kelowna General Hospital (KGH). Enter the Canadian CT Head Rules, a quick checklist to determine the best candidates for scanning. Though proven to be a valuable resource, a lack of adherence to these rules in emergency departments has been identified as the number one priority by the Canadian Association of Emergency Physicians. As part of the UBC Okanagan Faculty of Medicine’s Summer Student Research Program, Hannah Duyvewaardt is working with Ertel to identify roadblocks and improve adherence levels. 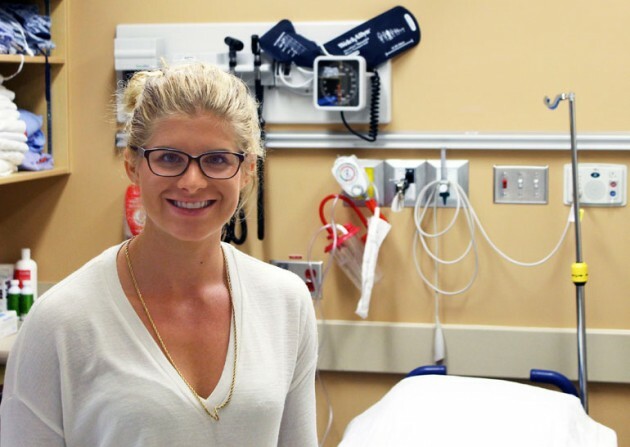 Duyvewaardt, a second-year medical student, spent the summer reviewing KGH patient data logged through the Canadian Hospitals Injury Reporting and Prevention Program. As part of their research, Ertel and Duyvewaardt have introduced a checklist that emergency room physicians should use before ordering a CT head scan. Duyvewaardt is continuing her involvement by helping to distribute educational resources and monitoring their impact. With increased education, they expect to see significant improvement in adherence levels, better utilization of resources, and reduced radiation exposure for non-qualified patients. Their research findings will be presented at the next CAEP conference and contribute to best practices for concussion diagnosis and management on a national level.